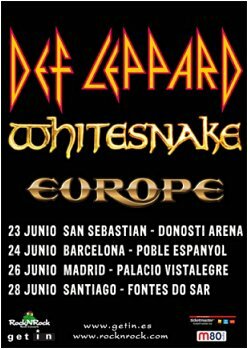 The show times for the Def Leppard, Whitesnake and Europe concerts in Spain have been revealed. The band will be on stage after 10pm at all four shows. The exact times are shown below as published by local press. As mentioned this is Def Leppard's first visit to the country since October 1996 on the Slang tour. The summer 2013 tour is now only 7 days away starting at Hellfest in Clisson, France.